A Central Coast wine trip was starting to become a regular January tradition for me – I’d done it four of the past five years. But since work commitments kept me from making such a trip this year, I needed to find another time to go. The perfect opportunity presented itself in the form of the wedding of my good friends’ son at a winery in Santa Ynez Valley in early July. I was able to put together an itinerary for a five-day trip through Paso Robles and to Santa Barbara County, and a few friends planned to join me – Jane and Chris, Alan, and the head Grape-Nut himself, Eric Anderson. Unfortunately Eric had to cancel at the last minute, so we had a small group for our Central Coast wine tour. Jane and Chris drove to Paso Robles on a Thursday, a day ahead and Alan and me. 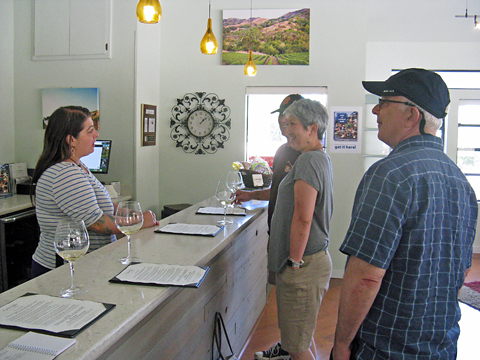 They visited Tablas Creek Vineyard that day, and they reported that they had an enjoyable time there – no surprise since the winery is one of our favorites in the area. I usually drive on these wine trips but Alan offered to pick me up and give me a ride this time, and it was nice to take a break from driving and to take over the role of navigator. More often than not, I was better at route-finding during the trip than the GPS instructions on Alan’s phone! The beginning of our Central Coast trip coincided with a brutal heat wave that hit much of California in early July. As Alan and I headed south on Friday through Salinas Valley and over the hills toward Paso Robles, we watched as the readings on the outside temperature gauge in his car continued to climb. By the time we rolled into Paso Robles itself – around mid-morning – it was already close to 100 degrees. We turned off the freeway just south of town and drove west along Highway 46, and it took us only a few minutes until we reached our first winery destination, located just off the highway near Vineyard Drive. Deovlet 2015 Chardonnay, Zotovich Vineyard, Sta. Rita Hills. Bright and citrusy aromas, with undertones of spice and lemonpeel. Medium-light weight on the palate with vibrant acidity, and a gravelly mineral note on the finish, very nice. Deovlet 2015 Chardonnay, Solomon Hills Vineyard, Santa Maria Valley. This had more floral aromatics, plus apple and citrus, herbs, and a saline quality. Medium-bodied with a lively texture and long finish, nice. Deovlet 2014 Chardonnay, Solomon Hills Vineyard, Santa Maria Valley. Similar floral character as the previous wine with a slightly riper fruit profile and a more noticeable earthy component. A bit richer mouthfeel but still fine acidity and a lively finish. Deovlet 2014 Chardonnay, Sanford & Benedict Vineyard, Sta. Rita Hills. Subtle pear and stone fruit, with earth and touches of spice and lees on the nose. Medium-rich texture with notes of stony minerals and a slightly nutty quality on the long finish, nice. Deovlet 2015 Pinot Noir, Bien Nacido Vineyard, Santa Maria Valley. This featured pretty floral aromas along with red fruit, herbs, and orangepeel. Medium weight with a lively mouthfeel and mildly chalky tannins on the finish, nice. Deovlet 2015 Pinot Noir, Zotovich Vineyard, Sta. Rita Hills. Displaying an earthier character than the Bien Nacido, this also had plummy fruit, stony minerals, and a savory herbal quality on the nose. Medium-bodied with a bit bigger texture than the previous wine and a bright finish. Deovlet 2015 Pinot Noir, Santa Barbara County. This showed plenty of savory notes along with flowers, earth, black cherry, and some vanilla/oak in support. Medium-rich mouthfeel with moderate but fine tannins, very pleasant. Deovlet 2015 Pinot Noir, Sanford & Benedict Vineyard, Sta. Rita Hills (pre-release). Lots of red fruit and spice, plus notes of darker berry fruit, earth, and a savory element. Medium weight with lively acidity and chalky tannins on the finish – needs time but great potential. Deovlet 2014 “Sonny Boy,” Happy Canyon of Santa Barbara. 60% Merlot, 40% Cabernet Sauvignon. Tobacco / dried herb aromas lead the way, with currant and black cherry fruit, earth, and spice in support. Medium-full bodied with bigger but refined tannins on the finish – tasty now and should age nicely. Our first stop of the day was at the tasting room of Deovlet Wines. I’d heard good things about the wines from several people but had not yet had the opportunity to try them myself. Alan managed to find a slightly shady parking spot and we walked toward the tasting room entrance, where we found Jane and Chris waiting for us. Though it was still only mid-morning, the temperature was already uncomfortably hot and we were glad to head inside, where Ryan Deovlet welcomed us. First things first – how is “Deovlet” pronounced? It turns out that it’s not as you might think – it’s “Dev-let”. A native Californian, Ryan has had an interesting journey that’s taken him into the wine world. Growing up, his passion was baseball, but an injury derailed his hopes of becoming a pro. The pull of baseball still was strong, though, so he changed his plans toward becoming a sports agent or even finding a position in the front office of a team. The complex flavors in cup of Kona coffee that Ryan drank while visiting his cousin on Hawaii’s Big Island and seeing how the coffee was grown and processed opened his eyes to something different. He soon signed up with the World Wide Opportunities on Organic Farms (WWOOF) organization for a chance to work on an organic farm in one of various locations around the world. In 2004, Ryan wound up going to Hunter Valley in Australia through WWOOF, and with no coffee plantations in the area, he turned his attention to vineyards and wine. Doing canopy management there got him fascinated with vineyards, and he continued by doing pruning work in New Zealand. Ryan told us that he loved how the people where he worked were both passionate and open, and he was able to learn a lot from them in a short time. Since returning to California, Ryan has worked with several highly-regarded vintners including Stephen Dooley and Paul Hobbs, while also gathering advice from winemakers David Ramey and Richard Sanford as well as vineyard managers such as Ulises Valdez and Ruben Solorzano. 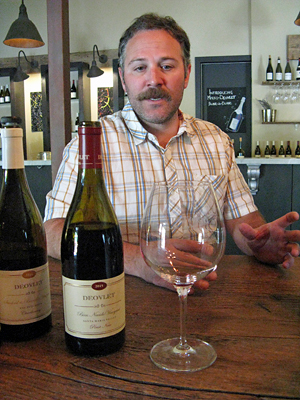 Pinot Noir fruit from Richard Sanford’s La Encantada Vineyard launched the Deovlet label in 2008, and Ryan has added Pinot and Chardonnay from other vineyard sources since then. The label’s focus is on single-vineyard Pinots and Chardonnays, and although these two varieties take up about 85% of his 2,500-case annual production, Ryan also makes a red Bordeaux-style blend. Single-vineyard bottlings are fairly small production (most are 150 cases or fewer) while appellation bottlings are larger. The wines are currently made at a facility in San Luis Obispo. In addition to his own label, Ryan teams up with fellow vintner McPrice Myers on a sparkling wine project called Myers-Deovlet – they’ve released vintages from 2013 and 2014 so far. Even with all that, he’s still found time to earn a certificate with the Court of Master Sommeliers. And if that’s not enough, Ryan is also the winemaker for Biddle Ranch Vineyard in Edna Valley and Refugio Ranch Vineyards in Santa Barbara County – he’s a busy guy! 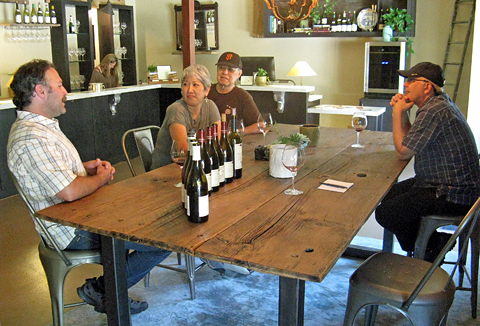 We all sat around a large table in the tasting room, and Ryan poured his Chardonnays for us. As we tasted, he told us a little about his Chardonnay winemaking. He starts the fermentations in stainless steel tanks, and he lets the temperature cool down to allow the wine to get a bit reductive – he feels that adds an element of “minerality” – before racking to barrel. Once in barrel, Ryan does little to no lees-stirring, and he likes to retain some malic acid in the wines rather than letting them go completely through malolactic fermentation. The single-vineyard Chardonnays are aged in about 20% new French oak while the Santa Barbara County bottling is aged entirely in neutral oak. Ryan told us that he wants to focus on site identity for his wines, so with a few minor exceptions, the Chardonnays all get very similar vinification. He wants to walk the fine line between old world and new world wines, and his goal is to produce wines that combine bright fruit and acidity with a savory quality and richness. The first wine that Ryan poured for us was the bright and minerally 2015 Zotovich Vineyard Chardonnay. The site, in the northern portion of the Sta. Rita Hills appellation, has very sandy soil. We followed this with two vintages of Solomon Hills Vineyard Chardonnays – both displayed a floral note but the 2015 showed a distinctive saline element while the 2014 was a bit earthier and richer in texture. Our final Chardonnay was the 2014 from Sanford & Benedict Vineyard, from own-rooted vines planted in 1971. All four of the Deovlet Chardonnays that we tasted were outstanding, some of the best from Santa Barbara County that I’ve tried for awhile. 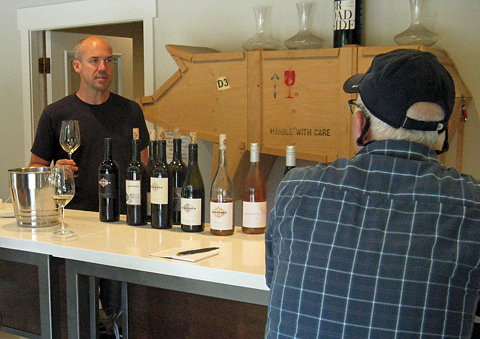 We moved on to Pinot Noirs – Ryan keeps the winemaking fairly simple on these. The fruit is mostly destemmed, with some whole clusters used in the fermentations for fruit from Zotovich and Sanford & Benedict vineyards. Ryan started us on the 2015 Pinot Noir from Bien Nacido Vineyard. The fruit came from the vineyard’s Q Block, planted in 1973 with Martini clone Pinot. The wine was very distinctive, quite floral with a note of orangepeel. Next was the savory and minerally 2015 Pinot from Zotovich Vineyard, followed by the 2015 Santa Barbara County bottling. This appellation bottling features a bit more new oak, which helps to keep the barrel program for the single-vineyard Pinots more consistent. The 2015 Sanford & Benedict Pinot (to be released this fall), like the Chardonnay, is from vines planted in 1971. Another distinctive wine, and Ryan said he feels it’s the best Pinot Noir he’s made. We finished up our tasting with the Deovlet “Sonny Boy” blend – 60% Merlot from Vogelzang Vineyard and 40% Cabernet Sauvignon from Star Lane Vineyard, both in Santa Barbara County’s Happy Canyon appellation. The “Sonny Boy” name comes from Ryan’s grandfather’s nickname for his grandsons. Ryan has added a new vineyard source for Bordeaux varieties – D2 Vineyard in the Adelaida District AVA. This will become a separate single-vineyard wine and will include Cabernet Sauvignon, Cabernet Franc, Merlot, and Petit Verdot. Ryan is planning to add a Pinot Blanc from La Encantada Vineyard to his line-up, and he told us that going forward, his vineyard focus for Chardonnay and Pinot Noir will be La Encantada, Zotovich, and Sanford & Benedict, all in the Sta. Rita Hills. You might not expect to taste top-notch Santa Barbara County Chardonnay and Pinot Noir on the Westside of Paso Robles, but having his tasting room there helps Ryan’s wines stand out from the crowd of Paso Rhônes and Zins. And the Deovlet wines really are top-notch, some of the best recent Santa Barbara Chards and Pinots I’ve tasted – as mentioned above, the Chardonnays in particular were stunning. All of the wines we tasted were very good, and favorites included the 2015 Zotovich Vineyard, 2015 Solomon Hills Vineyard, and 2014 Sanford & Benedict Vineyard Chardonnays and the 2015 Bien Nacido Vineyard and 2015 Sanford & Benedict Vineyard Pinot Noirs. Ryan has spoken of “nuance, elegance, balance, and restraint” in his wines, and those are apt descriptors. 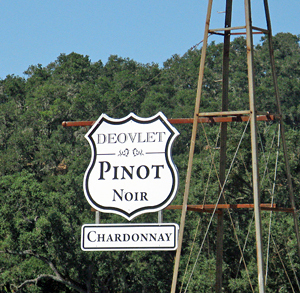 If you happen to be in the Paso Robles area but want to taste some of the best wines that Santa Barbara County has to offer, Deovlet is the place to go. Since our next wine-tasting appointment was in Cambria, we decided that getting out of the inland heat and having lunch in that coastal town would be a wise move. The temperature was indeed much more comfortable in Cambria, and we had lunch at Sandy's Deli & Bakery, near the north end of the town’s main street – appropriately named Main Street! I’d been to Sandy’s once before and remembered the huge and tasty sandwiches there. I probably should have split my turkey club with one of my companions (the sandwich comes with turkey, ham, bacon, cheddar, sprouts, cucumber, mayo, mustard, lettuce, tomato, pickle, onion, oil & vinegar, and pepperoncini on sourdough bread) but I was pretty hungry and managed to finish nearly the whole thing. 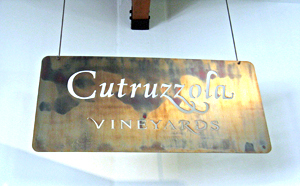 Cutruzzola 2012 Riesling, Estate, Riven Rock Vineyard, San Luis Obispo County. Aromas of ripe stone fruit with touches of petrol and herbs. Medium-bodied with lively acidity and a long, slightly sweet finish, a pleasant off-dry style Riesling. Cutruzzola 2014 Riesling, Estate, Riven Rock Vineyard, San Luis Obispo County. A contrast with the previous wine, this had citrus, flowers, and a stony mineral quality on the nose, with only a hint of petrol – though that may develop with time. Medium weight with vibrant acidity and crisp finish, nice. Cutruzzola 2013 Pinot Noir, “Gloria,” Estate, Riven Rock Vineyard, San Luis Obispo County. This displayed floral aromas along with black cherry fruit, fresh herbs, and earth. Medium-bodied with fine acidity and moderate tannins, nice. Cutruzzola 2013 Pinot Noir, “Giacomino Reserve,” Estate, Riven Rock Vineyard, San Luis Obispo County. Earth and spice on the nose, with bright plummy fruit and a vanilla/oak component. Slightly richer mouthfeel than the previous wine, with fine tannins. Cutruzzola 2014 Zinfandel, Susie’s Vineyard, Russian River Valley. Lots of upfront spice, with red and black fruit and a hint of sweet oak. Medium weight, with a moderately tannic finish. Cutruzzola 2013 Cider, Sonoma County. This had slightly sour apple and spice aromas, with a fresh and lively texture and finish. Our first stop of the afternoon was almost directly across the street from Sandy’s Deli – the tasting room of Cutruzzola Vineyards. 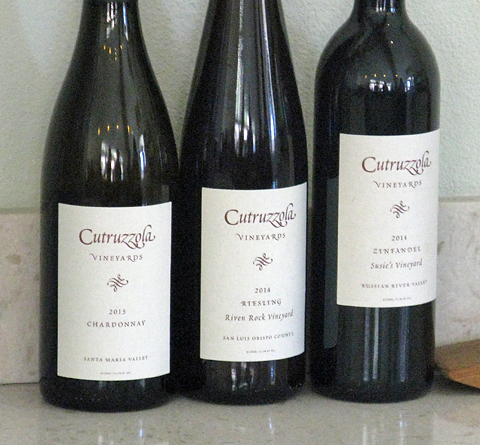 I’d first run across the Cutruzzola wines at the 2016 “Northern Exposure” tasting held by the Garagiste Wine Festival organization, which helps promote small and mostly lesser-known California wineries at their events. I’d tasted some very good Rieslings and Pinot Noirs at that time with winery proprietors Frank Cutruzzola and Lisa Miller, and I thought this would be a good opportunity to check out more of their wines. Frank, a radiologist, first became interested in Pinot Noir while he was at medical school at Yale. He actually made a few bottles of Pinot from a handful of vines he planted on Long Island! After moving to Sonoma County for his medical practice, Frank met Lisa at a local wine event. Lisa grew up in the area and had a particular love of Riesling. While on vacation in Cambria, they discovered a property for sale right up the road and decided that it would be a perfect cool-climate spot to grow their two favorite grape varieties, and they purchased it in 2000. Although the property is 47 acres, most of it is steep hillsides that would be difficult to plant and farm, so they’ve only planted seven acres to date. Called Riven Rock Vineyard, it’s located in a cool spot about six miles from the coast along Santa Rosa Creek Road. I’d hoped to visit Riven Rock Vineyard on this trip, but since Frank and Lisa were out of town, I wasn’t able to do that – it’s something I’d like to do in the future though. The vines are planted on steep south-facing slopes with rocky marine-origin soils. The vineyard includes two acres of Riesling and five acres of Pinot Noir, with Pinot clones Pommard 5, 23 (Mariafeld), 115, 667, and 828. The site was planted in 2001 and 2006, and it’s been dry-farmed since 2012. I’ve run across other vintners who buy fruit from Riven Rock, including Aaron Jackson for his Aequorea label. Noted Central Coast vintner Stephen Dooley of Stephen Ross Cellars has made the Cutruzzola wines since their inaugural vintage in 2009, and current production is about 750 cases per year. Frank and Lisa live part-time in Forestville in Sonoma County – they grow Zinfandel at a small vineyard there and they grow Gravenstein apples there as well. Lisa had put me in touch with their tasting room manager Reyna Jonas, and she welcomed us in to the bright and airy tasting room near the west end of Cambria’s Main Street. Reyna started us on tasting two vintages of the estate Riesling. She noted that they vary in style somewhat from year to year, with some being quite dry and some a bit sweeter. The 2012 Riesling, in an off-dry style, was made in stainless steel with no malolactic fermentation, featuring a touch of the variety’s petrol character along with some noticeable sweetness on the finish. The drier 2014 Riesling showed less petrol character but more vibrant acidity and a mineral note. We continued with Pinot Noir, beginning with the lovely floral and herbal 2013 “Gloria” Pinot, named for Frank’s mother. The 2013 “Giacomino Reserve” Pinot – named for Frank’s father – is a barrel selection, and was aged in two new and two neutral barrels – this was less fruit-forward than the “Gloria,” displaying more earth and spice. Our last wine was a 2014 Zinfandel from head-trained vines at the estate Susie’s Vineyard in Russian River Valley – aged for 30 months in 20% new oak, this had very spicy aromatics. Reyna asked us if we’d like to try their cider, made in a “Farmhouse Normandy” style from the organically-grown Gravenstein apples at Frank and Lisa’s Forestville property. The 2013 cider was tasty though I preferred the Cutruzzola wines to the cider. Cutruzzola is one of those tiny under-the-radar producers that’s easy to miss but worth the effort to seek out. If you’re wine-tasting in the Paso Robles area, it’s definitely a detour to make the drive out to the Cutruzzola tasting room in the coastal town of Cambria, but it’s a beautiful drive, and town itself is charming and offers plenty of other reasons to visit. The Cutruzzola wines were all enjoyable, and I thought the 2014 Riesling and both of the 2013 Pinot Noirs were standouts. Even though the distance from the Cutruzzola estate vineyard to Paso Robles is not that far as the crow flies, it’s really a world apart – it has little in common with the much warmer Paso region to the east and is more a part of the cool coastal areas of San Luis Obispo County. In fact there is an effort to create a new “San Luis Coastal” AVA to include coastal sites such as this one that are west of existing designated appellations. If you’re looking for something different when touring Paso Robles wine country, make the trek to Cambria and check out the cool-climate Cutruzzola wines. Levo 2015 “White Noise,” Santa Barbara County. 45% Grenache Blanc, 31% Roussanne, 24% Viognier. Floral and spicy, with pear and stone fruit notes on the nose. Medium-rich mouthfeel and finish. Levo 2013 “White Lightning,” Stolpman Vineyard, Ballard Canyon. 76% Roussanne, 26% Viognier. This displayed even more of a floral component than the first wine, with some herbal and honey notes plus tropical fruit. Moderately rich yet with lively acidity, this had a fresh finish, nice. Levo 2015 “Shades of Yellow,” Murmur Vineyard, Santa Maria Valley. 100% Chardonnay. Showing a bit of reductive matchstick aroma at first, this opened into apple and spice. A bit richer texture on the palate yet with a lively finish. Levo 2014 “Ember Red,” Ballard Canyon. 100% Grenache. Aromas of bright and fresh red fruit with savory and smoky undertones. Medium weight on the palate with fine acidity and moderate tannins, nice. 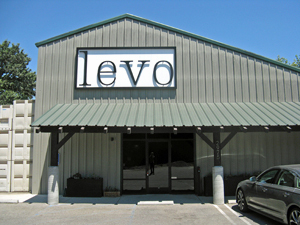 Levo 2014 “Spot,” Santa Barbara County. 100% Syrah. This featured lots of spice and herbs upfront, with dark berry fruit, black olives, and a touch of vanilla/oak in support. Medium-full bodied with great structure and fine tannins, nice. Levo 2014 Syrah, “Into the Static,” Santa Barbara County. 100% Syrah. Blackberry, spice, black pepper, and hints of flowers and sweet oak on the nose. Fairly big and structured, with firm tannins – should develop well with some bottle age. Levo 2014 Petite Sirah, “Into the Static,” Santa Barbara County. 85% Petite Sirah, 10% Grenache, 3% Syrah, 2% Viognier. This had aromas of dark fruit, coffee/mocha, and black pepper. Big and bold but with good acidity to keep it lively, with chewy tannins on the finish. Leaving Cambria, we drove back toward Paso Robles along Highway 46, the temperature rising steadily as we got farther from the coast. By the time we got to our next destination at Levo Wines in Paso Robles’ Tin City complex just south of town, the mercury had shot up to well over 100 degrees. As was the case at our previous stop, I’d discovered Levo at the 2016 “Northern Exposure” tasting of the Garagiste Wine Festival organization, which had been held in Oakland. I met owner/winemaker Bret Urness there and enjoyed his wines. They definitely fit into the overall “Paso style” of bigger wines but there was something different about them that intrigued me, so I thought this would be a good stop while I was in the area. Levo was established by Bret and a friend in 2011, and the first releases came in 2012. Bret is originally from the small town of Eagle, Idaho, near Boise. He’d helped out at a local winery while in high school, but hadn’t considered it a career path at that point. Bret moved to California in 2009, where he played football at Santa Barbara City College. At the same time, he was developing a growing interest in wine and applied to the major California college viticulture and enology programs but as he didn’t have the type of background they were looking for, he was not accepted. Rather than give up, he moved to Portugal’s Duoro Valley to work a harvest/crush season there. Working at a very low-tech operation there, he realized that he could make wine himself if he was able to source good-quality fruit and age the wine in good barrels. After moving back to California, Bret worked at Carr Winery in Santa Barbara County before starting out with his own label. The name “Levo” is derived from the Latin “to rise” – a reference to his roots in Eagle as well as a tribute to his father, who loves flying his own plane and who helped Bret get started in his business. Current production is around 1,000 cases per year, with a focus on Rhône grape varieties from Santa Barbara County, mostly from the Ballard Canyon and Los Alamos areas. Bret has been able to source fruit from some highly-regarded vineyards there. 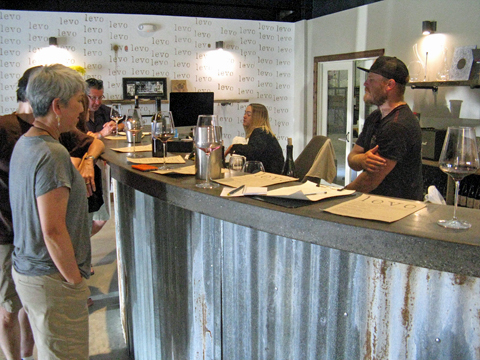 Bret moved the Levo operation to Tin City in early 2016, and judging by the number of people in his tasting room when we visited there, it’s become a popular destination. Why make the wine in Paso Robles when his fruit comes from Santa Barbara County? As I’ve heard from several other vintners over the years, winery regulations are much easier to deal with in San Luis Obispo County. Bret had told me that he might not be in when I would be visiting so he got me in touch with Raleigh Nejame, who Bret describes as his “Swiss army knife” around the winery, doing a little of everything there. After parking in front of the tasting room, we wasted no time heading from our cars and into the cool building. Raleigh greeted us at the busy tasting bar as we all found a spot there, and she began pouring us some of the current Levo releases. The first of three white wines was the 2015 “White Noise” – a blend of Grenache Blanc, Roussanne, and Viognier, aged in about 33% each new French oak, neutral oak, and stainless steel. The 2013 “White Lightning” is a Roussanne / Viognier blend, with fruit sourced from Stolpman Vineyard. Our final white was the 2015 “Shades of Yellow” – 100% Chardonnay from Murmur Vineyard in Santa Maria Valley. All three were fairly rich in texture, with the two Rhône variety blends showing floral aromatics. About this time Bret arrived and joined Raleigh behind the tasting bar. He told us that his wines have different names and labels every year since the blends differ each vintage. Bret prefers reductive winemaking, keeping oxygen contact to a minimum – this can mean that his wines need some time to open up. He uses a fair amount of new oak in aging many of his wines, and noted that he uses it to gain the tannic structure he is looking for in the reds rather than for aromatics. 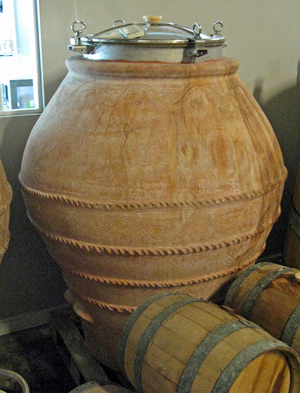 Bret also mentioned that many of his new oak vessels are puncheons rather than smaller barriques, most with light to medium toast – this helps reduce any overtly oaky character in the wines. He uses some whole clusters in the fermentations for reds, typically around 15-30%. We continued our tasting with four red wines. The bright and savory 2014 “Ember Red” – 100% Grenache – was sourced from Stolpman and Kimsey vineyards in Ballard Canyon, and made entirely in concrete. The 2014 “Spot” was a Syrah from White Hawk Vineyard in the Los Alamos area – this was aged in 50% each new French oak and neutral barrels and featured loads of herb and olive character. Finishing up were two wines called “Into the Static.” The first of the two was a 2014 Syrah sourced mostly from Presqu’ile Vineyard in Santa Maria Valley plus Kimsey and Murmur vineyards, made with 33% whole clusters and aged in about 60% new oak – this had peppery blackberry notes. The second “Into the Static” wine was a 2014 Petite Sirah with fruit from Stolpman, Kimsey, and Murmur vineyards and aged in about 50% new oak – coffee and mocha aromas with nice acidity. One current Levo wine we didn’t taste was the 2016 “Flying Colors” Rosé, from Grenache plus a little Grenache Blanc and Viognier. After we were finished with our tasting, Bret asked us if we wanted to take a look in the winery space behind the tasting room, and he led us through the door. Pretty typical space for a smaller winery (as Bret had told us it would be!) and still plenty cool inside despite the brutal heat of that afternoon. We had a really nice visit with Raleigh and Bret at the Levo tasting room and winery. 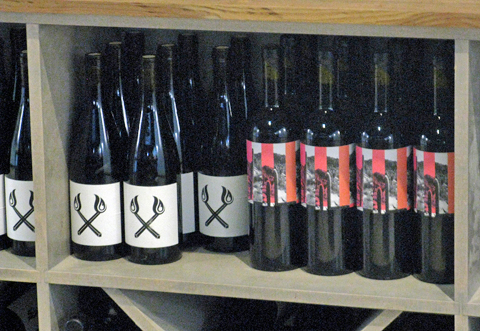 The Tin City location is very convenient, and the wines are certainly worth checking out. 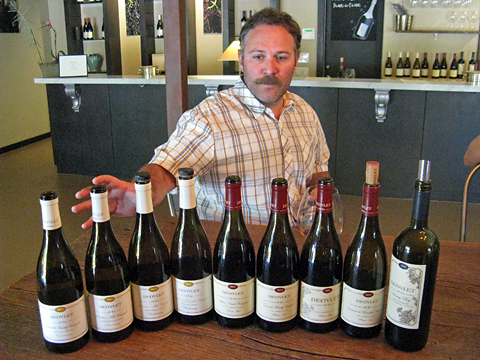 Bret’s emphasis on wines from Rhône varieties grown in Santa Barbara County sets Levo apart from other Paso-area producers, and the wines show a distinctiveness from other Paso bottlings that I think is largely due to Levo’s vineyard sources. Overall, I felt the red wines were the stars here, although I particularly liked the 2013 “White Lightning” among the whites. The 2014 “Ember Red” and 2014 “Spot” were my favorite reds – nice balance of ripe fruit and savory qualities. Levo’s wines will appeal to those who enjoy the bigger “Paso style” but are looking for something just a little different. Giornata 2016 “Il Campo Bianco,” Paso Robles. 50% each Pinot Grigio and Falanghina. Bright and floral aromas with stone fruit and a bit of tropical fruit. Clean, fresh mouthfeel and finish, nice. Transmission 2016 Rosé of Grenache, Paso Robles. Light salmon color, with slightly tart red fruit and a hint of flowers. Lively texture and crisp finish. Giornata 2016 Falanghina, Paso Robles. Very floral aromatics along with orangepeel, earth, and a savory component. Medium-bodied with a slightly chalky texture and finish – fascinating wine that makes you think and provides plenty of enjoyment too, a standout. Giornata 2016 Barbera, Paso Robles. Bright and fruit-forward black cherry, with herbal and earthy undertones. Medium-light weight with fine acidity and mild tannins. Transmission 2016 Zinfandel, Paso Robles. Spicy berry fruit with touches of black pepper and fresh herbs. Medium-light bodied with a lively mouthfeel and finish, nice. Transmission 2016 Grenache, Paso Robles. This displayed earthy red fruit, spice, and a stony mineral note. Fresh acidity and medium weight on the palate, with moderate tannins, nice. Giornata 2014 Sangiovese, Luna Matta Vineyard, Paso Robles. Ripe cherry fruit along with spice, earth, and dried herb on the nose. Medium-bodied with good structure and firm tannins – good potential, and this deserves a few years in the cellar to develop. Giornata 2014 “Gemellaia,” Paso Robles. 65% Merlot, 25% Sangiovese, 10% Petit Verdot. Aromas of ripe black cherry fruit, spice, and sweet oak. Medium-rich texture with a moderately tannic finish. Giornata 2015 Aglianico, French Camp Vineyard, Paso Robles. Dark berry fruit with lots of spice, plus dried herbs, earth, and a hint of flowers. Bold mouthfeel with big, chewy tannins – a big wine that will stand up to bottle aging. Giornata 2014 Nebbiolo, Luna Matta Vineyard, Paso Robles. Vibrant aromatics of flowers, cherry, earth, and tar, with herbal undertones. Medium-bodied with fine acidity and firm tannins on the finish – approachable even now but this deserves time in the cellar to develop further. It was a very short trip to our last winery stop of the day – we probably would have walked had it not been for the 110+ degree heat. Giornata Wines is located just across the road from the main part of Paso Robles’ Tin City. Giornata has made their wines in a few different locations over the years but they’ve been in their Tin City space since 2013 and they seem to be settled in there for the long term. I’ve been familiar with Giornata – one of California’s best producers of wines made from Italian grape varieties – for nearly ten years and have visited with owners Brian and Stephy Terrizzi a number of times and always enjoy it. Stephy was out of town during my visit and Brian was out taking care of some other business but their assistant winemaker Dave McDonald welcomed us in. 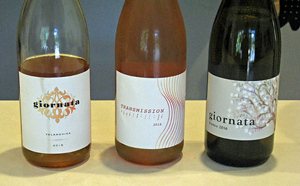 I’d met Dave several times, and I’d emailed him that I was also interested in tasting his own Transmission wines, which he makes at the Giornata facility. Brian and Stephy have planted a four-acre vineyard adjacent to their home in the eastern portion of Paso Robles’ Templeton Gap – an area where cooler marine air flows through a low spot in the coastal mountains and is funneled to the east. Varieties at their estate vineyard include Friulano, Trebbiano, Ribolla Gialla, Sangiovese, and Nebbiolo. The vineyard should produce its first commercial crop this year, so we can look for some upcoming Giornata wines to feature fruit from there. Dave has been involved in various aspects of the wine business for many years, and he’s worked at both Giornata and Broadside since 2011 – he’s now the assistant winemaker for both labels. He released his first Transmission wine just a couple of years ago. I’d tasted the 2014 Transmission Zinfandel with Dave in early 2016 and was impressed. Dave aims for a different style from most Paso winemakers – he picks early for freshness, acidity, and lower alcohol, and he avoids aging in new oak. The distinctive white on black label art of the Zin I tasted last year and the Transmission name led me to the guess – which turned out to be correct – that it’s partly inspired by the band Joy Division, one of my favorites and apparently one of Dave’s as well (he’s noted that the name is also a nod to David Bowie’s “TVC15”). Dave started out our tasting with the fresh and floral Giornata 2016 “Il Campo Bianco” – 50% each Pinot Grigio and Falanghina sourced from two vineyards in the Paso Robles region. The fruit was destemmed and crushed, and kept on the skins for a few hours prior to pressing. Next was Transmission 2016 Rosé of Grenache – this also has a touch of Barbera in it. The Grenache fruit was sourced from the Templeton Gap area and picked early for this wine, which was fermented in stainless steel drums – a subtle rosé with plenty of acidity. Our last white was Giornata’s 2016 Falanghina. With fruit sourced from Castoro Vineyard, this was fermented on the skins for about a month in a clay amphora. After pressing, the wine was aged in the amphora until it was bottled in May, with less than 40 cases made – very distinctive, one of the most attractive wines made in an orange wine style that I’ve had from California. On to red wines, beginning with the Giornata 2016 Barbera, sourced from two vineyards and aged in a 2,000-liter oval wood tank plus a little in stainless steel, then bottled early as an easy-drinking chillable red. Transmission’s 2015 Zinfandel was next. Dave told us that the fruit was sourced from Nightingale Vineyard on San Marcos Road in the northern part of the Paso region but he switched to a different vineyard for his 2016 Zin (which should be released later this year). This is definitely not your typical big, ripe Paso Zin! Fresh and bright, with lively acidity. We followed this with the Transmission 2015 Grenache – 100% Tablas clone Grenache aged in neutral vessels, this lighter version of the variety is a departure from most Grenache made in the region. We moved on to four Giornata reds. The 2014 Sangiovese from Luna Matta Vineyard was aged in neutral oak – this is a more “serious” rendition of the variety than many you’ll find in California. The riper, richer 2014 “Gemellaia” is a Super Tuscan style blend of Merlot, Sangiovese, and Petit Verdot, aged in about 60% new French oak. The name of the blend – derived from “gemelli”, Italian for twins – is in honor of the Terrizzis’ twin daughters. The 2015 French Camp Vineyard Aglianico was next. Dave told us that this variety gets a late start each year and a late harvest, and even at its warmer vineyard site they’re able to make the wine at under 14% alcohol. We finished with 2014 Luna Matta Vineyard Nebbiolo, the flagship wine of the Giornata label. This undergoes an extended maceration before pressing to help tame the variety’s tannins, and the wine is barrel-aged for about 24 months prior to bottling. I’ve tasted every vintage of Nebbiolo that Giornata has made since 2006 and I think this may well be their best yet – given how good many of their others have been, that’s saying something. Other Giornata wines that we didn’t taste on this visit include Fiano, Ramato (skin-fermented Pinot Gris), and “Il Campo Rosso” – as with the “Bianco” version of this wine, the blend can change from year to year. Transmission will be releasing its first Chardonnay later this year. All of the Giornata and Transmission wines are typically fermented with native yeasts. As it turned out, we happened to visit the winery on Dave’s birthday, and while we tasted, several of his friends came by to start preparations for a birthday barbecue. And just as we were getting ready to leave, Brian Terrizzi got back to the winery – it was nice that we had a chance to see him and talk with him even if only for a couple of minutes. Right from the start, Brian and Stephy have been doing a lot to help push California wines from Italian grape varieties toward a more “serious” and higher quality level with their Giornata wines. I think that they have maintained the right approach – picking on the early side, minimal intervention in the winery, and limited use of new oak. And Dave’s very similar approach to winemaking with his Transmission wines shows that it works well with varieties such as Grenache and Zin too. Every one of the wines we tasted on this visit was very good, and favorites included the Giornata 2016 “Il Campo Bianco,” 2016 Falanghina, and 2014 Nebbiolo, and the Transmission 2016 Zinfandel and 2016 Grenache. It’s necessary to make an appointment to taste these wines, but I highly recommend it – they’re different than pretty much any other wines you’ll find in the Paso Robles area, and I think they’re some of the best from the region. By the time we left Giornata in the late afternoon, we were all so worn out from the heat of the day (and all that wine-tasting) that we didn’t even stop for a beer at Barrelhouse Brewing in Tin City. Weather reports I saw that evening gave the day’s high temperature in the area as 112 to 116. Summers in Paso Robles are known to be hot, but not that hot! We were all staying at Melody Ranch Motel in Paso Robles, so we drove into town – Alan and I stopped to grab a 6-pack of Firestone 805 along the way – and crashed at the motel until it was time for dinner. Jane had made dinner reservations for us at La Cosecha Bar + Restaurant, right on the main square in Paso and a short walk from our motel. I hadn’t been to La Cosecha before, but it fit the bill perfectly for dinner on that blazing hot day. Of course the dining area was nice and cool, and their specialties – small plates and pizzas – were perfect for sharing without getting filled up. And although we brought a couple of our own bottles to dinner, La Cosecha has a very good wine list, centered on Spain and Portugal, Chile and Argentina, and the Central Coast. I’d definitely go back for another dinner there. It had been a long and very hot first day of the wine trip, packing in four appointments and trying to find anyplace we could to beat the heat. It was my first visit to three of the four wineries and tasting rooms, and it’s always fun to check out places that are new to me.